FROM TODAY, APRIL 11, SPEED IS LIMITED IN * ALL THE URBAN HULL OF GRANADA AT 30 KM / HOUR *. ATTENTION: Traffic restrictions during Easter week. 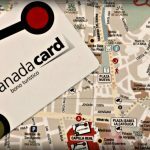 During the period between Sunday April 14 to April 21 there will be traffic cuts that will especially affect the center of the city of Granada and access to our parking. Throughout the week, around 4:00 p.m., all the accesses and routes that run along Gran Vía de Colón, Reyes Católicos, Acera del Darro, Recogidas, Angel Ganivet Street and adjacent streets, will be closed to traffic due to the different processional parades. Due to this, it will not be possible to reach the vicinity of our parking lot until the completion of the processional parades. We have private parking spaces within a public parking lot whose management and staff are totally unrelated to our organization. It is located 2 minutes walk from our establishment. To reserve a parking space, carefully read the following conditions and fill in the form below. You will receive confirmation of your reservation as soon as possible. – The parking service is subject to availability and only for customers who have already booked in our establishment. – The parking space reservation will not be formalised until we have received a confirmation email from the establishment to the email address specified by the client. PRICE: From Sunday to Thursday € 14 per vehicle per day. Fridays and Saturdays and BankHolidays: € 16 per vehicle per day. Nest Style Granada Nest Style Granada will not be responsible for the possible charges that the parking staff could apply to the client in case of parking in a different place from the one assigned by the hotel. CANCELLATION OR MODIFICATION POLICY: Permitted up to 48 hours before the arrival date. Outside this period, the first night will be charged as a cancellation fee. Please fill in the following form to request a parking space.